This section has information on birds I am frequently asked about. It therefore includes birds that I have never seen, or see only rarely, and leaves out a lot of common relatively easily found species. It is no longer possible to keep this section up to date. However excellent topical birding information can be found at Chris Watson’s website. The following websites contain a lot of useful information bird distribution and abundance. Be aware that these are accumulations of data, and that birds may have long left the area where they were recorded. Birdata has maps showing records of the Bird Atlas Australia wide. This is a very useful source, but remember that it is an accumulation of observations for nearly 10 years. A cluster of, say Pied Honeyeater, records means that an observer was there in a good year, not that you are likely to see them at any other time. NT Bird Atlas also contains Atlas data. Both of these give an excellent indication of how commonly (or rarely) some species are seen. At present there is one nature guide operating out of Alice Springs, Alice Springs Budget Tours. Following the good rains in of the 2010/11 summer most of the Centre is fairly lush. **This site was originally written and updated by our long-time Club President Bob Read, who is currently travelling and only occasionally comes back to Alice Springs. As the new web master for the site, I have begun to update some of the pages but have not yet had time to bring the bird reports up-to-date. Any comments and reports of success or failure at the sites mentioned would be welcome. As I have only limited time to go birding, I have to rely heavily on second-hand information to try to give up to date information, please email me with any new information. I have added the following symbols to indicate access. Sealed road, suitable for all cars. Includes gravel road, generally suitable for all cars, BUT car hire companies will not allow their 2WD cars to be used on un-sealed roads. They may make an exception for short access roads, such as the one into Ellery Big Hole, but check this with the hire company. Conditions vary with time. Before travelling check road conditions and be sure that your vehicle is prepared for and capable of handling the conditions, and note the restrictions on hire cars as above.. Species are in taxonomic order. I suggest using Find (Ctrl F) in your browser to find a species. These are at the Alice Springs Sewage Ponds fairly often. As of January 2007 the numbers of all duck species were depleted, and I saw no Freckled Ducks. I suspect that this is following the same pattern as last year, with most ducks moving north to the areas where heavy rains have fallen. The Freckled Ducks seem to have deserted the ponds for the time. The last report I know of was November 2006. 8th August 2002, on the swamp that takes the overflow from the Sewage Ponds, north of Ilparpa Road. Rob Burgoyne. None known. The swamp is receiving water from the ponds infrequently, and is not likely to provide suitable habitat. In 2001 and 2002 these were often seen at Mac Clarke Reserve . As of March 2003 they had disappeared. With the drier conditions the Plains Rats they were preying on have gone and kites with them. Grey Falcons have been reported over a wide area. Around Alice Springs they have been reported at the Old Telegraph Station and Olive Pink Botanic Garden. According to Donato et al. the species was regularly seen near Kata Tjuta in the Uluru-KataTjuta National Park, but none have been reported from that area in the most recent Atlas. This turns up infrequently around Alice. Could be anywhere in the region. Quite often seen near the Alice Springs Sewage Ponds. Seen several times along the New Crown to Mount Dare road in July 03. Field guides indicate that this species does not occur in Central Australia. After the good rains in 2000 it was fairly common around the Centre, mostly in well-grassed areas near creeks. Two pastoralists told me of large numbers of a kind of quail they have not seen before. With the return of normal (drier) conditions they are much more scarce, but as of mid 2003 there were still some along the Hugh River north of Namatjira Drive. Common in areas with good grass cover north of Alice Springs and probably elsewhere in the region. This is a scarce and cryptic species is very hard to find. It has been recorded only twice in Central Australia in the most recent Atlas. Thomas and Thomas' sighting of 29 at Kunoth Bore was a rare event, as they have not been seen on numerous other visits to this area. They would be equally likely to turn up on any other piece of suitable habitat. I know of no recent sightings in this area. They have been seen at Newhaven. Occasionally seen near the intersection of the Andado - Alice Springs road and the road to Mac Clarke Reserve. Spotlight searches on foot on two occasions were unsuccessful, as was driving slowly along many kilometres of track over similar gibber plains. I also searched gibber plains near the New Crown to Mount Dare road both by day and with a spotlight at night without success. 6/8/2004, success at last! I found a flock of about 10 next to the road north of the Mac Clarke turnoff, at 24o 59' 23" S 135o 24' 03" E . I only found these because I stopped to look at some Orange Chats and a dotterel happened to be in the field of view of the binoculars! Without binoculars they were invisible except when moving. This is a very difficult species to spot. Keep looking for stones that move. It has been reported 5 km from Marla on the Oodnadatta road, near a borrow pit on the N side of the road, but I had no success there in July 2003. 27o 17' 48" S 133o41' 15" E.
Strangely at times road-killed Inland Dotterels have been found on Alice Springs streets. Apparently they were hit at some unknown location and carried a long distance on radiator grilles. July 2007, 5 adults and 1 chick between Mac Clarke Reserve and the turnoff, 25o07' 37" S 135o 29' 06" E (M.and G. Goode). To the north around Tennant Creek they are more common, and are seen on the plains. E.g. near Mary Anne Dam near Tennant Creek, on hill before car park (RobGosford). Often in the car-park and picnic ground at Ormiston Gorge. If you travel a reasonable distance on roads in the area, such as the LasseterHighway, the road to Andado or the Plenty Highway, or on the Stuart Highway from Port Augusta to Alice Springs, you have a good chance of seeing them. They are often seen feeding on the seeds of melons (Citrullus colocynthus and C. lanatus) that grow on the edge of roads. This species has always been scarce in the southern NT, and is possibly even scarcer now. The only recent sightings I am aware of are the two in the current Bird Atlas. I have been told of a small flock of the birds near Alice circa 1990. In 2010 they were seen near Alice Springs. Bred on Aboriginal Lands west of Alice Springs, but this is only accessible to organised tours. This species is very much influenced by rains. At times it is very common around Alice Springs, and then may disappear for months. Sometimes seen coming for water at the small dam near KUNOTH BORE at sunrise and sunset. Can be anywhere in the mulga scrub around Kunoth Bore. Early July 03 fairly common in creeks with Red Mulga and Gidgee along the New Crown Mount Dare Road . For example the creek just north of the NT-SA border fence near 25 59 25 S 135 11 53 E.
This species was recorded in Central Australia in the first Bird Atlas, but has not been reported in the current Atlas. I regard it as a rare vagrant. There was a chance sighting of this species south of Alice Springs in 2005, but the birds could not be found the next day and have not been reported since. This is a difficult species for the visitor to find. Its numbers fluctuate dramatically with the seasons. Areas where this bird was known to occur such as the Pound Walk Ormiston Gorge and the Dolomite Walk at Ellery Gorge were burnt in fires of autumn 2002. To the best of my knowledge they have not been seen in these locations since. Reported to be fairly common at Newhaven. However I did not find them there despite searching a lot of promising looking spinifex. The area west of the Sewage Ponds where they were formerly found burnt out in 2002. They are said to have been seen in the MacDonnell Ranges near Alice, but my opinion is that most (or all?) of it is too frequently burnt and lacks the maturespinifex this species needs. It could occur anywhere there is suitable mature spinifex. It also sometimes occurs in other tall thick grass. They have been seen along the Santa Teresa Road, including at the site mentioned below for Rufous-crowned Emu-wren. However they are much harder to find and may take some hours searching. Less than half searchers find them at this location. In the past I have found them fairly easily, but on 22/7/2006 extensive searching of this area and other similar habitat, including the two additional sites mentioned below under Rufous-crowned Emu-wren was unsuccessful. About 12-14km along the Warrego Rd outside of Tennant Creek - in the large stretch of mature spinifex along the southern side of the road. Suspect that they are in reasonable numbers in any large mature patches of spinifex in that area (Rob Gosford). I visited this area on 25/6/2007. The habitat certainly looked suitable, but I was unable to find any Spinifexbirds, possibly because of the unusually cold rainy weather. Was widespread in 2010, and probably still is with the good seasonal conditions. I suspect this species is widespread, just hard to find because of its habit of hiding inspinifex tussocks, emitting occasional faint squeaks. I mostly see it in out of the way places. It has been seen in the Alice Springs Commonage, west of the dump. This area was burnt out in 2002, and on top of that recent fencing off of the track has made access to this area more difficult. Seen south of the road 22/7/2006. Also at 24 02 24 S 134 07 40 E and 24 03 20 S 134 12 19 E. They are probably distributed throughout the spinifex-covered limestone ridge habitat, which occurs intermittently from the "tyre in pole" site up to the Santa Teresa gate. Ellery Big Hole, The areas where there this species was formerly seen all appear to have been burnt in 2002, and it will probably be years before the birds return. Likewise the area near the Ochre Pits. Ormiston Pound. This area burnt out in 2002 and the emu-wrens have not been seen there since. Ormiston Gorge Access Road. 1.Eastern side of the Ormiston access road, 200 m south of the major creek crossing after leaving Namatjira Drive, among tall spinifexand shrubs. 2. 100 m from Namatjira Drive in mature spinifex on the left of the road April 2007 (Greg Oakley, birding-aus). At Tecticornia on Newhaven and also at the northern Lake Bennett lookout , 22 45 52 S 131 00 35 E. In both cases the birds were in low Melaleucashrubs with spinifex understorey. This is a rather scarce species. I have seen it occasionally, and there seems to be no particular pattern. This species is widespread and common, but can be difficult for visitors to find. It is found in spinifex and low shrubland (especially chenopod) habitats. It appears to be sedentary, remaining in drought periods. In my experience it is the commonest bird in the Simpson Desert. Sewage Ponds in low vegetation to the south of the ponds. They can nearly always be seen from the road around the edge of the large pond. There are also some Variegated Fairy-wrens. The low vegetation around Ilparpa Swamp. Rainbow Valley Conservation Reserve, near the information shelter. Along the Hugh River Stock Route Road. In low vegetation along the Stuart Highway north of Alice Springs, such as McGrath Creek 23o 18'36" S 133o 47'28" E.
This species is restricted to areas of the Simpson Desert where canegrass grows on the dunes. The only easily accessible part of the desert in the NT is in the Andadoarea. Eyreans can be found on the dune near the Mac Clarke turnoff, and sometimes other dunes in the area. In spring they may be easy to find. At other times the only indication of their presence will be tracks and perhaps a few faint whistles. Note that canegrass makes squeaking noises as it moves with the wind, and White-winged Fairy-wrens share the same habitat. 6/8/2004, seen on the dune next to the road north from the Mac Clarke intersection, 25o 05'24" S 135o 23'13". The best strategy is to sit and wait among the canegrass, rather than to actively search. They can always be found on the upper part of Mount Gillen , though not everyone will be happy to scramble up 200 to 300 m (vertical distance) of rocky slopes. From Flynn Grave. Go through the foot gate about 80 m west, and follow the path that leads mostly west to the summit. The grasswrens can be anywhere past the saddle about half way up or on the summit ridge, but most commonly in the area between a clump of pine trees and the foot of the cliffs. Simpsons Gap , on the slope at the foot of the cliff on the west side of the path from the carpark to the Gap. Seen here in 21/7/2006. One opinion is that you need to be there very early before the crowds, but I once saw them in mid-afternoon. Standley Chasm , near rocky areas along the access road. Ormiston Gorge , on the Pound Walk where it crosses the ridges into the Pound. Despite this area being burnt in 2002 they were back here in late May 2003. Ellery Big Hole , in West Macdonnell National Park , on the Dolomite Walk, the bit that did not burn in the fires of 2002. Larapinta Trail, Stage 6, at the saddle 2 km east of Ellery Big Hole. Mount Sonder, along Stage 12 of the Larapinta Trail. The Rim Walk, Trephina Gorge , on the side of the valley where theTrephina Gorge Walk descends to the creek. Arltunga Historical Reserve , in Joker Gorge . Kings Canyon, start of Creek Walk July 2007 (Tom Wilson). At Native Gap . This locality has bitumen road access 115 km north along the Stuart Highway from Alice Springs and requires only a short climb to the top of the ridge above the microwave repeater station. It is very convenient for anyone travelling the Stuart Highway north of Alice Springs. On the hills around Anna's Reservoir Conservation Reserve . Reported on Newhaven, though I could not find them myself despite searching promising habitat. This is a sedentary species and there is a good chance of finding it at any of the localities above. This species is hard to find. In the most recent Atlas this species was recorded 6 times at Watarrka, and once at Uluru. It seems to be regularly seen at these locations. It has also been recorded further north west in the Tanami region. It occurs at Newhaven, but few visitors see it there. Near KUNOTH BORE on the Old Hamilton Downs Road , 21/7/2006. Often in the mulga to about 6 km south of Kunoth Bore. On walk west of Old Hamilton Downs. Sometimes reported around the Old Telegraph Station. Kings Canyon. On the Resort Walk July 2007 (Tom Wilson). Glen Helen, July 2007. Opposite the entrance to the resort from Namatjira Drive (Tom Wilson). Uluru, on the walk to the cultural centre July 2007 (Tom Wilson). They are reported to be relatively common at Newhaven , but I have seen none in two visits. This species is not known to occur in the NT (the South Australians will be annoyed if it is found, as they would lose their only endemic), but is found just south of the border in SA. In June 2003 they were seen near the Stuart Highway about 32.5 km north of Marla, close to a 'kangaroo' sign 27o 03' 38" S 133o 27' 18" E. They were in low saltbush and bluebush shrubs in a mixed flock with Southern Whiteface. Reported to be still in this area August 2003. 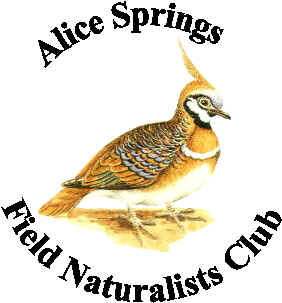 At times this bird has been reported around Alice. In April 2003 it was common on Newhaven . However in April 2004 I saw only one bird, a short walk (say 500 m) south of Main Camp. Its stronghold is the area in and around the Simpson Desert. Most of this is difficult to get to. It sometimes occurs in the Mac Clarke Reserve , but I did not find in in June 2006, nor anywhere along the road from Alice Springs toAndado via Santa Teresa, probably because of the very dry conditions. There is a chance of seeing it in suitable habitat along the Stuart Highway from about Marla toErldunda. My experience is that this species is very nomadic. I am lucky to see it once a year. It appears erratically, and is seldom seen at the same location on the next day. It is often reported from KUNOTH BORE , and 5 km south at the eremophilapatch probably because that is where it is most often looked for. Olive Pink Botanic Garden . Ask the caretaker for the most likely spot. In 2005 a pair bred at Olive Pink Botanic Garden. I suspect that they are resident in the nearby area, but are not always present in the garden. Some sightings at Newhaven . It could turn up anywhere with suitable shrubland habitat. For example it has been seen at the Old Telegraph Station , (most recently that I know of April 2003) and in the area SW of Flynn Grave , but not very often. Clusters of sightings around Alice Springs, Kunoth Bore and Newhaven. A few sightings at Ayers Rock and Watarrka. This is pretty close to the density of Atlas surveys, that is GHEs are most often found in places where a lot of people look for them. This species is nomadic. It turns up after rain, and is extremely scarce in droughts. This species is nomadic, similar to the above, but scarcer. This is a highly nomadic species and it is difficult (or impossible?) to predict where they might be. In 1997 after good summer rains they bred in the area SW of Flynn Grave. Despite even better rains in 2000 and 2001 I did not see them in this area again until 14/12/2002, following the November rains, after which they disappeared again. These are also seasonal and highly nomadic. In good seasons they may be common in suitable habitat, as around the edges of saltlakes. In drier times they disappear. Yellow Chat has been recorded at the Sewage Ponds, circa 1990. It seems a pair may have been blown in by freak weather conditions. This species appears to be a rare vagrant in Central Australia. In the NT this species is restricted to the stony plains ("gibber") near the SA border. It is rather cryptic and seems to be relatively scarce. I have seen it near the intersection of the Andado - Alice Springs road and the Mac Clarke Road, but it took a great deal of searching to find it. 6/8/2004, one in the gibber the eastern end of the Mac Clarke Reserve, outside the fenced area. One seen at Mac Clarke Reserve, May 2005. In June 2006 this area was drought-stricken and I saw none. The first Bird Atlas had records across the southern NT. The second only has records south and east of Alice Springs. The reasons for the change are not known. This species can sometimes be found on the first 20 km or so of the Hugh River Stock Route Road , which turns off the Stuart Highway (Maryvale signpost) 12 km south of Jim's Place, about 100 km south of Alice Springs. Also on the road to Chambers Pillar, especially where it crosses the Charlotte Range. This species is listed as regular for the Southern Region of Central Australian on the Parks and Wildlife Bird Check List for Central Australia. The Uluru-Kata Tjuta National Park checklist lists it as rare. It was recorded in that area in the first Bird Atlas, and nowhere else in the NT. It was not recorded in the NT in the second Bird Atlas. I suspect that it occurs in parts of the Uluru-Kata Tjuta National Park no longer accessible to the public, and possibly also on Aboriginal Land. Historic records indicate that its range extended to Bushy Park, northeast of Alice Springs, but I do not know of any recent sightings in this area. It is a mystery what has caused the contraction in range. The Uluru-Kata Tjuta National Park checklist lists it as rare. I suspect that it occurs in parts of the Park no longer accessible to the public. Generally seen in flight. This and the Welcome Swallow (less common ) are the only two species in the Centre with long deeply forked tails. It is easily recognisedby the white in both the upper and under-wing views. At Alice Springs Sewage Ponds in summer. These are widespread in rocky areas, nearly always close to water. At times they are on the side of Sewage Ponds , but no recent reports. They are likely to be abundant in N'Dhala Gorge Nature Park if there is water in the creek. Also Palm Valley , John Hayes Rockhole , Standley Chasm and Trephina Gorge . This species is fairly common throughout the region, including urban Alice Springs. Occasionally seen flying over Todd Mall, or foraging in garden beds. There are several bowers in suburban gardens. There is a resident bird and a bower in Olive Pink Botanic Garden , near the John Blakeman shelter, ask the caretaker. Semi-tame ones often scavenge in the Ormiston Gorge carpark and picnic ground. Often seen at the Old Telegraph Station. Seen more or less continually at Olive Pink Botanic Garden and around Alice Springs.